Pope Francis, leader of the world’s nearly 1.1 billion Catholics, enjoys broad support across much of the world, according to a new survey report by the Pew Research Center. A median of 60% across 43 nations have a favorable view of the pontiff. Only 11% see the pope unfavorably, and 28% give no rating. Francis’ strongest support comes from Europe, where a median of 84% offer a favorable rating. Latin America – the pope’s home region – also gives him high marks, with 72% saying they have a positive opinion.1 However, Francis is less well-known in other parts of the world. In Africa, 44% say they like the pope, but 40% offer no rating. Asians are similarly unfamiliar with Francis, with 41% supporting him and 45% expressing no opinion. The Middle East is the most negative toward Francis, with a quarter viewing him unfavorably. However, an equal number (25%) give a positive rating and a plurality (41%) do not rate him. Americans are particularly fond of Pope Francis, with more than three-quarters (78%) giving him positive marks. These are among the key findings from two surveys by the Pew Research Center, one conducted from October 30, 2013 to March 4, 2014, among 14,564 respondents in nine Latin American countries, and another from March 17 to June 5, 2014, among 36,430 respondents in 34 countries. In the 21 countries surveyed with sizable Catholic populations, Catholics overwhelmingly say they view Pope Francis favorably. And, in all of these countries, Catholics express more support for the pope than non-Catholics. It is worth noting that these gaps in favorability do not necessarily mean that non-Catholics view Francis unfavorably. In fact, in most countries with sizable differences, non-Catholics are more likely to have no set opinion of the pope than a negative one. The biggest differences among favorable views of Francis appear in Latin American countries. While the pope receives extremely positive marks from Catholics throughout the region, wide gaps exist between Catholics and non-Catholics in Mexico (-63 percentage points), Nicaragua (-58), El Salvador (-56), Venezuela (-52), Peru (-47), Colombia (-46) and Brazil (-45). However, non-Catholics in these countries generally give no rating for Pope Francis, rather than say they do not like him. In the U.S. and Europe, the favorability gap is less substantial. Spain (-25), the U.S. (-19), Poland (-17), Germany (-17) and France (-12) show smaller differences in support for the pope across the denominational divide. Both Catholics and non-Catholics in all of these countries overwhelmingly voice favorable attitudes towards Francis. Majorities or pluralities of the general public in 28 of the 43 countries surveyed say they have a positive view of Pope Francis. Europe and Latin America give the pope particularly high ratings – majorities in almost every country in these two regions view the pope favorably. In his home country of Argentina, 91% have a favorable opinion of Francis, including 65% with a very favorable view. Majorities in every other Latin American country also see the pope in a positive light, including seven-in-ten or more in Colombia (83%), Mexico (74%), Brazil (74%) and Peru (72%). Eight-in-ten or more also express support for the pope in Poland (92%), Italy (91%), France (88%), Spain (84%) and Germany (82%). A smaller portion, yet still a majority, in the United Kingdom (65%) view Francis favorably. Roughly half the Greeks (49%) agree, though nearly a quarter (24%) have an unfavorable view and about three-in-ten (28%) do not rate him. His favorability is lower in other regions, though many say they cannot rate him, have never heard of him or do not have an opinion. In Asia, broad majorities in the Philippines (88%) and South Korea (86%) express positive views of Francis. At least four-in-ten give favorable views in Thailand (49%), Bangladesh (47%), Vietnam (41%) and Japan (40%). But majorities in Indonesia (57%), India (61%), Malaysia (76%) and Pakistan (85%) do not have an opinion of the pope at all. A similar pattern arises in Africa. Majorities in Uganda (70%), Tanzania (70%) and Kenya (56%) – countries with the highest percentages of Catholics in the African nations surveyed – give the pope a favorable rating. However, four-in-ten or more in Ghana (40%), Nigeria (46%), South Africa (52%) and Senegal (55%), where more people tend to be Protestant or Muslim, offer no opinion. Many in the Middle East do not offer a rating of the pope. But of those who have an opinion, there are interesting differences between countries. Francis is most popular in Lebanon (62% favorable), where more than a quarter of the population is Catholic. And half in Israel give the pope favorable marks. (Pope Francis visited Israel and the Palestinian territories about two weeks after the survey was conducted.) 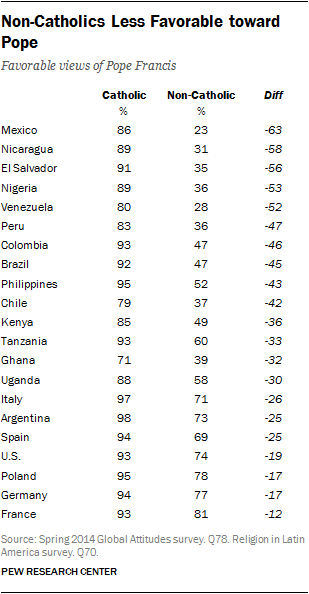 However, the pope receives his most negative ratings in Egypt (35% unfavorable), Jordan (34%) and Turkey (32%). Like many other countries with small Catholic populations, the pope is relatively unknown in Tunisia (71% no rating) and the Palestinian territories (63%).